Volcanoes are mountains whose tops are opened downward. These openings reach below the surface of the earth – where the rock is molten. Volcanoes are mostly closed like a soda bottle, but below which the pressure continues to grow over time. When the pressure reaches a certain level the hot lava suddenly came out. Anybody living near the volcano will certainly become unconscious – after hearing the loud noise. A volcano is built when magma below the surface of earth rises. The rising magma starts to form gas bubbles. These gas bubbles are already dissolved in the magma due to extreme pressures – much like a soda bottle which has carbon dioxide dissolved in it. Bubbling magma builds-up gas pressure against the surface of the earth under the volcano. When the gas pressure grows to extreme levels – The Volcano erupts – and BOOM! When the eruption occurs, it allows the high pressurized gasses and lava to escape from magma reservoir with earth’s geothermal energy. You can consider this as a way for our earth to release the excess energy. Magma is the mixture of molten rock, semi-molten rock, and solid particles. It is found below the earth’s surface. When magma is ejected through a volcano – it is called lava. Heat for melting the rock comes from the earth’s geothermal energy. 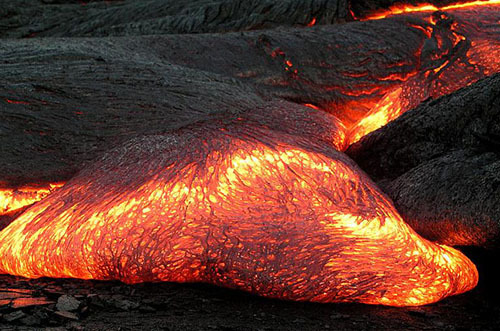 Lava is the magma after the eruption – having temperatures of 700 C – 1200 C in the liquid state. It doesn’t flow below the earth’s surface – that is the difference between the lava and the magma. Lava is mainly composed of silicon and oxygen. It gets mixed with other elements when it flows from vent towards the ground. There are four types of the volcanoes according to the geological and geographical features. Cinder Cone Volcanoes – These volcanoes are very simple in shape. They are made from the single vent for the eruption of lava. They are very violent and builds-up into a circular cone shape over time. Volcanoes in this type never grow more than a 1000 feet in height. 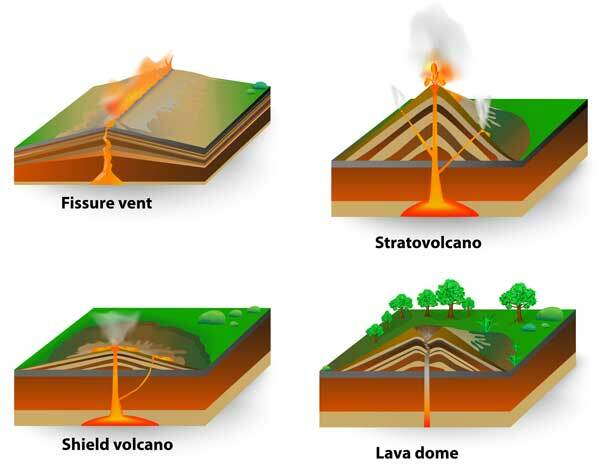 Composite Volcanoes (Stratovolcano)– These volcanoes are made of many layers of lava. Volcanoes in this type have many layers through which lava can flow. These volcanoes also explode violently and reach a height of 8000 feet. Shield Volcanoes – These volcanoes cover very large areas, and are very wide. They erupt low-viscosity lava. The slop of these volcanoes is very shallow. As a result, the lava can reach far away. These volcanoes are less violent than other types. Lava Domes – These volcanoes erupt very high-viscosity lava, which can’t go further away from the vent. As a result, the lava solidifies around the vent and forms a dome that grows over time. Mauna Loa is the largest volcano found on our Earth – reaching a height of 4 kilometers. The largest volcano on our solar system is Olympus Mons – its height reaches to 27 kilometers. It is found on the Mars. Volcanic eruption severely damages the forests around them – sometimes destroys them entirely. Our Earth has 1500 active volcanoes from which 20 Volcanoes are erupting on the earth at any time. 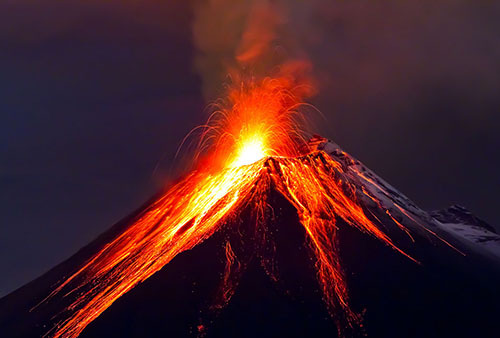 Abdul Wahab, "Volcano," in Science4Fun, April 13, 2019, http://science4fun.info/volcano/.